You are here: Home � All Deals , Media: Books Movies Magazines MP3s � Expired: Ice Age: Dawn of the Dinosaurs DVD + Digital Copy + Blu-ray disc all in one pack - for $10. 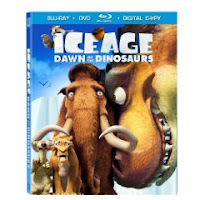 Expired: Ice Age: Dawn of the Dinosaurs DVD + Digital Copy + Blu-ray disc all in one pack - for $10. Expired Deal: Amazon is offering Ice Age: Dawn of the Dinosaurs (DVD + Digital Copy) [Blu-ray] for $10. The best thing about this offer is it comes with two types of disc, BluRay and DVD, and a digital copy for your computer. So in theory if you have a close friend you could give them the DVD disc, while keeping the BluRay for yourself... or vice versa... and then put it on Grandma's computer or whatever. How you break that all down, or hoard the movie in 3 different formats is all up to you.. I'm just planting the seed for brainstorming. Read reviews about the movie or check out this offer yourself by clicking here.